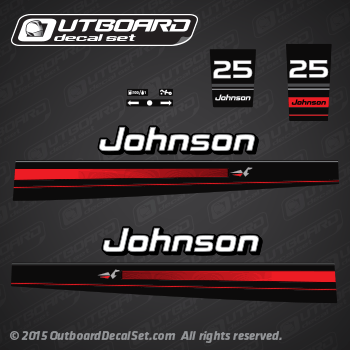 Johnson 25 hp decal set for engine covers from 1994, 1995 and 1996. BJ25BAEDR, BJ25BALEDR, BJ25BREDC, BJ25BRLEDC, BJ25EEDM, BJ25ELEDM, BJ25EREDC, BJ25ERLEDC, HJ25FPO, HJ25RAEDA, HJ25RLEDA, HJ25RSLO, HJ25TELEDA, J25EEDM, J25EEOA, J25ELEDM, J25ELEOA, J25JREDC, J25JREOS, J25REDA, J25REOR, J25RLEDA, J25RLEOR, J25RWEDC, J25RWEOS, J25RWERD, J25RWLEDC, J25RWLEOS, J25RWLERD, J25TEEDA, J25TEEOR, J25TELEDA, J25TELEOR, SJ25RDEDC, SJ25REDA, SJ25RLEDA, SJ25TEEDA. With 0437183, 0435149, 0437186, 0437184, 0437185, 0435154, 0435151 ENGINE COVER ASSY.